The photo was taken on the 15th of June at 7:30 PM Pacific Daylight Time in Seattle, so the solar altitude would have been about 14 degrees. The sun is just out of shot below the bottom of the frame. All day long there had been a 22 degree halo and most of the time it was a full circle. The 22 degree halo is pretty common; it’s a circular rainbow around the sun caused by hexagonal ice crystals in the upper atmosphere. And indeed there were a lot of high cirrus clouds that day. I see these fairly frequently because I look for them; most people don’t look towards the sun when looking for rainbows. The bright spot in the bottom, above the sun, looks like a sun dog but it is directly above the sun, not beside it. I think instead this is what was left of the 22 degree halo, and was just particularly bright due to the thick cloud there. Above the bright spot we see two rainbows tangent to each other, bending in opposite directions, both with the red side facing the sun. I have never seen this phenomenon before; I think it is a circumzenithal arc. Anyone out there with knowledge of meteorology or optics who can identify and/or explain these phenomena in the comments, please do! This entry was posted in Non-computer and tagged rainbows; weather by ericlippert. Bookmark the permalink. Phil Plait had a good post last year on Bad Astronomy where he explained a picture that contained the various halo effects that can be seen around the sun. Reading that post (and especially the diagram he linked near the bottom of the post) I’d say you’re right. 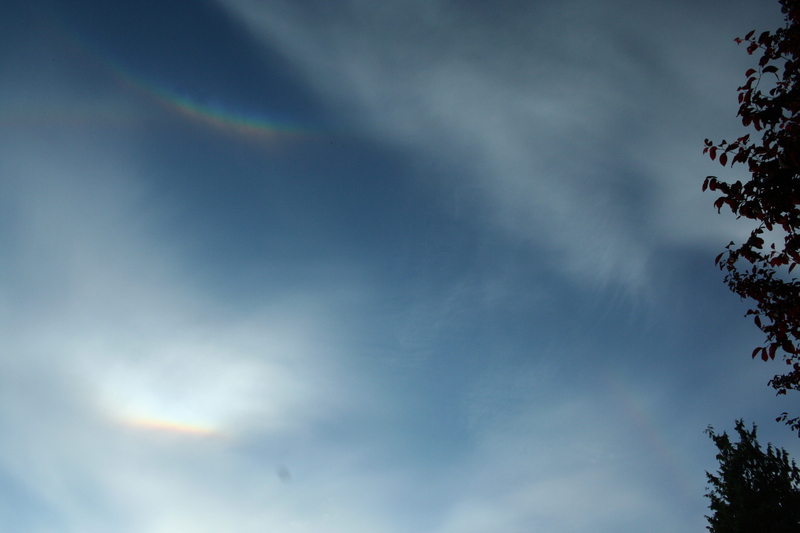 Specifically, I think it’s the circumzenithal arc meeting the supralateral arc. Thanks for that link; that is an astonishing photograph! Sorry if I am being rude, but whatever happened to the series on bad performance testing? It is ongoing. The next episode will go up in July. The photo doesn’t do justice to how incredible it looked. Nice! 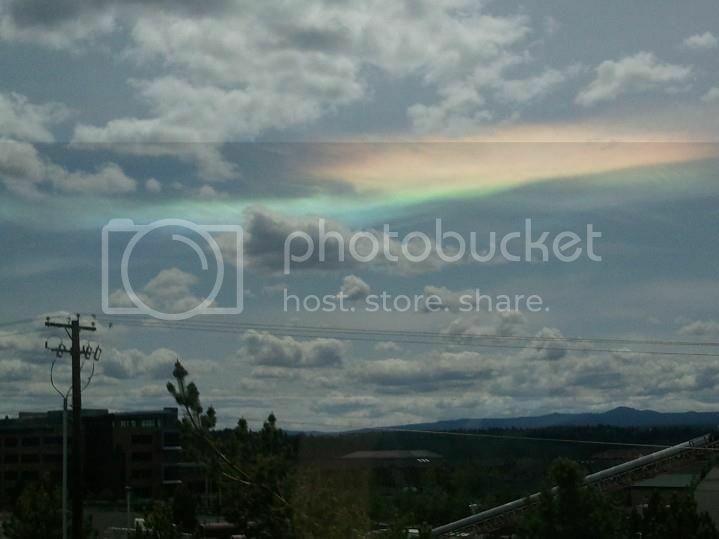 I think that might be a circumhorizontal arc. Looks like your picture was removed? Not sure how that happened. I’ve fixed it. Thanks for the note!